The White House was built to house the President of the United States. The White House has stood as a symbol of the Presidency for more than 200 years. In December 1790, President George Washington signed an act of Congress. The first cornerstone was laid on October 13, 1792. President John Adams was the very first president to move into the house. Approximately 6,000 people visit the White House each day. There is a mini White House in Dublin, Ireland. The British set fire to the President’s house in 1814. The South Portico was constructed in 1824 and the North Portico in 1829. The West Wing, originally known as the Executive Office Building was only meant to be temporary. The president receives a bill each month for his and the family’s food and other expenses. The amount is deducted from the presidential salary. It was known as the Executive Mansion before Theodore Roosevelt. The address of White House is: 1600 Pennsylvania Avenue, Washington D.C. The entire house has 35 bathrooms, 132 rooms, 412 doors and 147 windows. The White House was designed by the Irish architect James Hoban. He won the design competition in 1792. It takes 570 gallons of paint to paint the outside of the building. 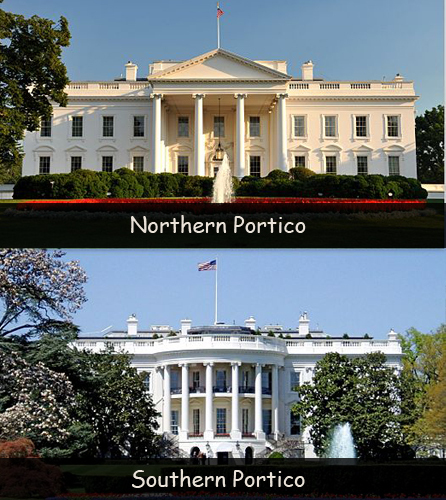 The White House is a national heritage site owned by the National Park Services. The White House got electricity in 1891 first. Winston Churchill the former British Prime Minister claimed that he saw the ghost of President Abraham Lincoln when he emerged from the bathroom of Lincoln’s bedroom. Declan, Tobin. " Fun Facts for Kids about the White House ." Easy Science for Kids, Apr 2019. Web. 25 Apr 2019. < https://easyscienceforkids.com/the-white-house/ >.